For this month’s edition of Irish Trucker, we profile Dungannon based Fabcon Engineering Ltd and speak to managing director Kevin Hughes about the success of the business and their latest product to enter the market, the Fabcon Container Tilting machine.Companies and businesses are always looking at ways to improve their business in an effective and cost saving way. Whether it be a small tool that can save time in doing a job or a large machine that could allow the company to make huge savings, innovative ideas are something that businesses are always eager to unearth. Engineering firms play a massive part in many industries, especially where steelwork is concerned. The haulage industry, warehouses, waste management companies and other factories rely on engineering firms to help them get the most out of their business. 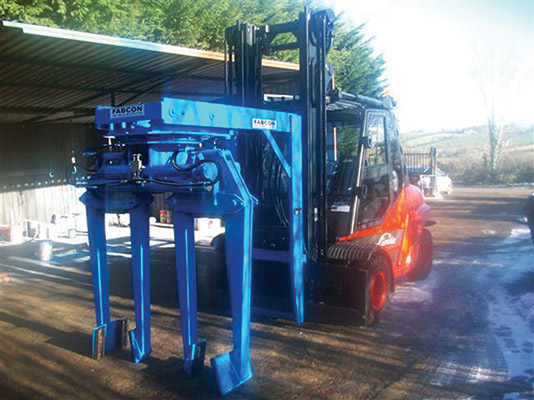 As a limited company located near Dungannon, County Tyrone, Northern Ireland, Fabcon Engineering is one of the leading manufacturers of forklift and lorry attachments in Ireland and the UK. First, let’s take a look at the history of the company. Kevin and his business partner Brian Donaghy established the business in 1989 and it has now become one of the leading manufacturers of forklift and lorry attachments in Ireland and the UK as they provide top quality products and services to their extensive customer base. “Myself and Brian worked for Finlay Engineering Ltd for a number of years. We picked up a lot of experience there and we felt that we wanted to go out on our own and start our own business,” said Kevin. “It was hard work at first, but we had a few contacts and they gave us some business at the start and I’m pleased to say we are still working for some of them today. “Brian looks after the sales end of the business, while I’m involved with the design and manufacture of the products. All Fabcon equipment is CE-Marked, load-tested and certified and complies fully with all safety requirements to ensure that the highest quality standard is met by the team. The customer base has grown considerably over the years and the company not only supply their products to Ireland and the U.K, but much further afield as Kevin revealed. “Internet sales have saw our customer base expand to places like India, Australia and Mauritius to name just a few of the countries we have dealt with in recent times. Kevin added that the container tilters have certainly helped pick up the slack. Other products include the quad pack clamp attachment which allows faster loading and saves time, while using less trucks to lower fuel bills and maintenance costs. The safety aspects means there are safer operations with less vehicle movements. “Our equipment uses industry-standard specifications and we can also custom-make to your own specification, including finishing your clamp, grab or forks in your company colour. Kevin is pleased with the direction that the business is heading and he feels that once they continue to ensure they produce a quality product, the business has a long future. “We’re coping with the workload that we have at the moment. We have an experienced team here all of who are very good at their jobs, which has played a huge part in the success of the business.